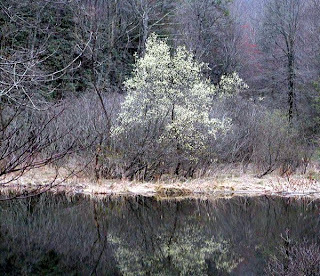 While the spring flowers are starting to bloom, the forest is taking its sweet time and waking up very gradually. Many of the trees have buds on them and we were just telling guests the other day that it will probably be several more weeks until we see real color return to the deciduous trees. And then bam. Or BLOOM, as the case may be. This tree across our little lake exploded with yellow flowers in what seemed like less than a 24-hour period. We love when spring makes a big statement every now and then. whoa, that is just stunning!